Bernard McNamara’s 500-bedroom hotel has been under the control of Bank of Scotland (Ireland) since February 2012 when Paul McCann of Grant Thornton was appointed as receiver. Bernard bought the hotel along with the adjacent site for €288m at the height of the boom in 2007. The 4-star hotel in Ballsbridge – its website is here – is understood to be trading “satisfactorily” with sources claiming the latest pre tax profits are in the region of €5m. Sources say the hotel is about to be put on the market in September 2012 with property powerhouse CBRE handling the sale. The asking price is understood to be in the €55-60m range, representing a staggering 81% discount on the 2007 price. There had been rumours of an impending sale last summer, with the previous owners the Doyle group touted as prospective buyers. The prices bandied about last summer were in the €44-50m range. Neither CBRE nor Grant Thornton had any comment on the matter today. As recently revealed on here, at least one sixth of the hotel rooms in the State are under bank control, with over half of these under the control of NAMA and NAMA banks. NAMA has said that its strategy is to “hold” hotels until the second half of this decade, though the Agency is keen to claim that it is not financially supporting “unsustainable” hotels – competitors still suspect that NAMA is nursing loss-making hotels in the hope that any recovery in hotel prices will offset current losses. It seems however that the non-NAMA banks, including Ulster Bank and BoS(I) may adopt an earlier disposal strategy. Last year, the Four Seasons Hotel in Ballsbridge which was owned by Derek Quinlan’s Nollaig Partnership was sold for €15m, about half the apparent asking price. Earlier this year, “Russia’s richest woman” Elena Baturina bought Hugh O’Regan’s Dublin city centre Morrison Hotel for €20-25m. Bernard McNamara’s 145-bedroom Cork International Hotel went on the market through Savills in June 2012 with an asking price of €4.75m. As exclusively reported on here, NAMA has recently sold one of Bernard’s landmark office buildings, the Bank of Ireland branch on the corner of St Stephen’s Green and Merrion Row for €7.5m. UPDATE: 29th August, 2012. Though a higher guide price is mentioned – between €65m and €75m – the Irish Independent today confirms the hotel is coming onto the market through CBRE, which incidentally didn’t know it had received the instruction when contacted by this website at the start of August 2012! UPDATE: 5th September, 2012. Jack Fagan today reports that another of McNamara’s hotels, the Parknasilla in Sneem in Kerry has come on the market through Savills with a price tage of just €10m compared with its purchase price of €40m and a subsequent refurbishment said to have cost over €10m. UPDATE (2): 6th November 2012. Sources are this evening claiming that the purchase price was €67.5m. No comment yet from Blackstone. With calls from the usually even-tempered Fianna Fail finance spokesperson Michael McGrath for the Gardai to investigate the revelations in yesterday’s Sunday Times that a property secured on a NAMA loan was sold to an employee of the Agency, without first coming on to the open market, and with NAMA flailing around with an investigation by its internal auditors Deloitte, now might be a good time to remind ourselves of the scandal-in-waiting that is NAMA’s practice of allowing the off-market sale of property secured by its loans. NAMA is overseeing the sale of nearly €500m of property a month EVERY SINGLE MONTH between Jan 2011 to December 2013. We know that because NAMA has a disposal target of €7.5bn of its assets to the end of 2013 – the €7.5bn is NAMA’s valuation and we know that NAMA paid an average of 43c in the euro for the loans it acquired, so the original book value of disposals by the end of 2013 is an average of €17.44bn. So for each of the 36 months between January 2011 and December 2013, NAMA, or more accurately, its receivers and developers, are flogging an average of €484m of property a month. And yet we know practically nothing about these sales. There is a wretchedly inadequate attempt on here to track NAMA’s sales as they are reported in the media or other sources, but it is a drop in the ocean of NAMA’s actual sales. Fianna Fail has been particularly vocal in calling for NAMA to ensure all property for sale under the Agency’s auspices is publicly available, and that sales details are published after sales are concluded. Deputy McGrath has already tackled Minister for Finance Michael Noonan about a previous off-market sale in Cork. Having said that, Sinn Fein has also introduced a Bill which, like Senator Mark Daly’s, seems destined to gather dust or fail. Fine Gael was vocal in criticising NAMA as a “secretive organisation”, whilst in Opposition and in the General Election campaign but have since gone on to defend NAMA’s secrecy, for example at the recent reading of Senator Daly’s Bill in the Seanad. NAMA says it must comply with the NAMA Act, terms of loan contracts and must act to protect its commercial freedoms. However what NAMA conveniently ignores is that the public is not concerned with sales of property which mean the original loans and indebtedness of developers is 100% discharged. What we are concerned about are those sales which leave a shortfall in the original loan, a shortfall which we are all picking up through the bank bailout. As for NAMA’s whinging about commercial concerns, in the UK there is transparency of pricing and contracts for property sales which doesn’t seem to undermine that market. Although it remains to be seen if there was any malfeasance in this present case – and NAMA is saying that “at this stage” it seems the sale was carried out “with probity” – the case helpfully serves to illustrate the scandal-in-waiting from NAMA’s secretive and opaque operations. (1) How did Enda Farrell know that Thomas Dowd was a NAMA borrower. 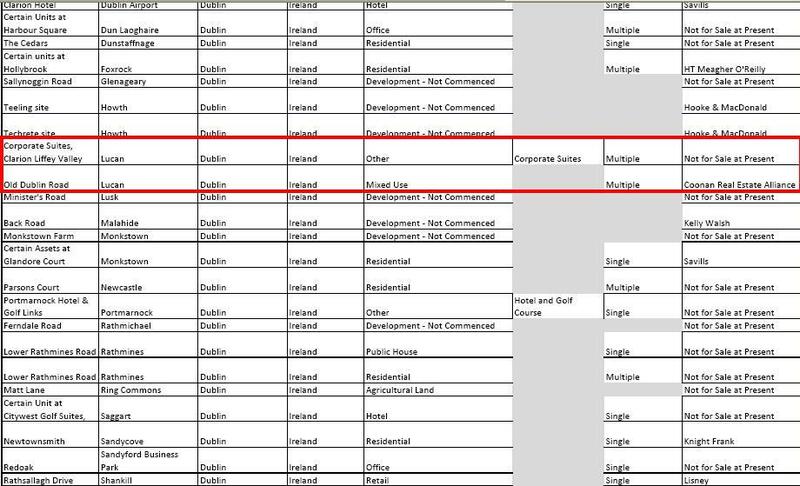 There is a listing on here of people and companies which have been associated with NAMA, and although Thomas Dowd appears on that list as an associate of Derek Quinlan, I do not believe it has ever come into the public domain that he [Thomas Dowd] is himself in NAMA. (2) How did Enda Farrell know that the property, identified as a 5-bedroom house with development potential, in Lucan in west Dublin, was for sale. It is not listed on the NAMA foreclosure list – extract below showing the two properties in Lucan – for January 2012. (3) How does NAMA know that the price achieved – reportedly €410,000 – was the market price? It is reported that the property was acquired by Thomas Dowd “around 10 years ago” for €1.2m. Its value would presumably have risen between 2002-2007 when property in Ireland generally peaked. The property had development potential which can be a nightmare for valuers to pin down. And we all know that there is a paucity of transactions in Ireland at present, evidenced by weak mortgage lending. (4) Why did this property not come onto the open market? On the face of it, at €410,000 it is not particularly valuable and it is merely a residence, albeit one with apparent development potential. This was seemingly not some extraordinarily unusual property that is used by NAMA to justify selling property off-market. (5) Did Enda Farrell require a mortgage for the €410,000 purchase, and if so, was there communication between the mortgage provider and Enda Farrell’s employer, NAMA, to confirm salary and contract information. And if there was, why did NAMA – or the NTMA who in fact employ NAMA staff and “rent” them out to NAMA – realise that one of its employees was buying one of its properties. (6) NAMA must publish its procedures for monitoring the potential for its employees to benefit from confidential information obtained in the Agency. Deputy McGrath is demanding that NAMA seek to establish if there any offence has been committed under the NAMA Act, but the Act appears to be silent on employees unless they happen to be members of the NAMA board. It seems from some reports yesterday, that NAMA has terms inserted in employment contracts to help it avoid employees benefiting from confidential information, but it is unclear whether these terms were relevant in this case, and if they were, if they were complied with. (7) How many other properties subject to NAMA loans have been acquired by NAMA employees or their close family or associates? From private messages received on here in the last 24 hours, the answer would seem to be more than zero! At the end of last week, banks – NOT Anglo Irish Bank for what it is worth but said to be “Barclays, Certus and the Bank of Ireland” – sold the world-famous Belfry golf and hotel resort near Birmingham for an undisclosed price, but understood to be close to GBP 90m (€115m). The original owner of the Belfry is – according to the Guardian – one Sean Quinn Junior, son of former tycoon Sean Quinn, and currently doing a three-month stretch in Dublin’s Mountjoy Prison following contempt proceedings in a Dublin court. The Belfry was bought in 2005 for a reported GBP 186m and it is understood the banks were still owed around GBP 105m before the sale, so it seems that there is still a loss to be made up by the Quinns. The new owners are an American private equity group KSL Capital Partners, who in turn own ClubCorp, a golf club operator, however in this case it is De Vere that will operate the club. Despite being purchased with development in mind, and despite the lenders including NAMA bank, Bank of Ireland, NAMA mysteriously never acquired the Quinn loans, which given the Agency’s great play during High Court proceedings on the systemic value of Paddy McKillen’s loans which apart from €30m were non-development, is a particular mystery. The 50% decline in value of the Belfry is attributed to the UK’s credit crunch and 2007-onwards downturn. The defiance of someone jailed for contempt issuing what would otherwise be an everyday statement, is unsettling. How long before Sean Junior gets on Liveline to defend the family’s actions?